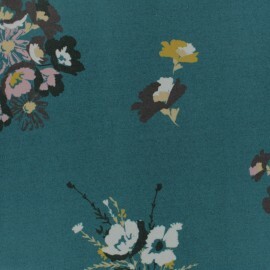 This Caprice Viscose fabric is a slightly elasticated and high quality viscose fabric with floral patterns on a delicate peacock blue background. Make a pretty loose top, a blouse or flowing dress and more ! 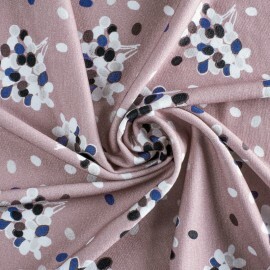 This Prunille Viscose fabric is a slightly elasticated and high quality viscose fabric with floral patterns on a delicate old pink background. Make a pretty loose top, a blouse or flowing dress and more ! 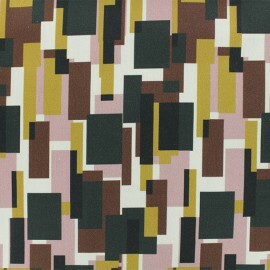 Fall for this beautiful Montebello gabardine fabric with 3% elastane and graphic pattern. This Oeko-Tex certified cotton fabric has a nice fall will be your ally for your creations of clothes, accessories or home accessories. Choose to be trendy with this pattern of rectangles with mustard and burgundy tones, make a pretty vintage dress or a shirt for men. Fall for this beautiful Riverside gabardine fabric with 3% elastane and graphic pattern. 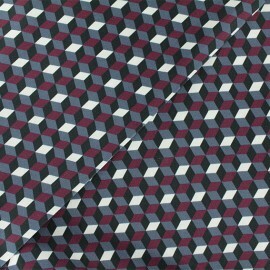 This Oeko-Tex certified cotton fabric has a nice fall will be your ally for your creations of clothes, accessories or home accessories.Choose to be trendy with this pattern of cubes with black and burgundy tones, make a pretty vintage dress or a shirt for men.